Florida Man is a seasonal Double IPA released by Cigar City Brewing. Named after the infamous Florida Man meme, the brewery contacted me to help them refresh the label design for their can release. 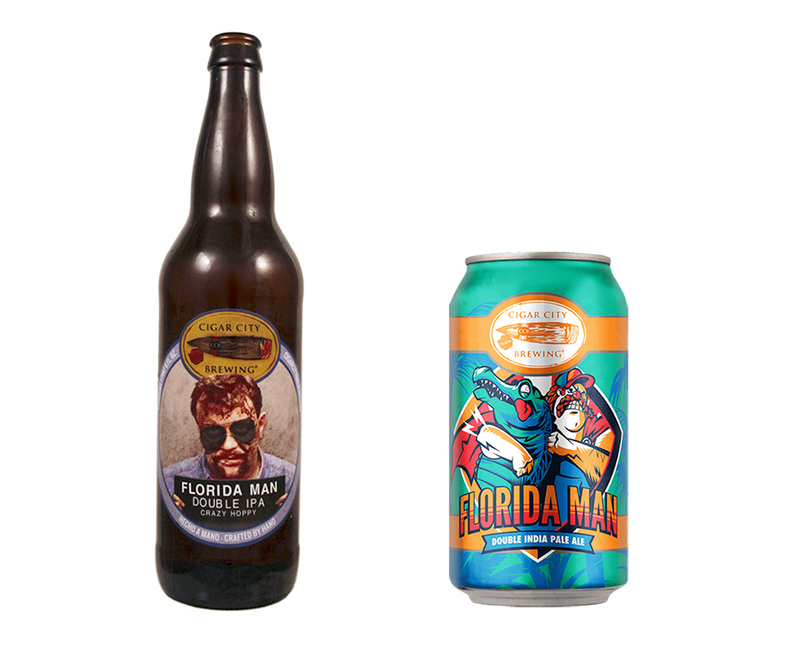 Previously available exclusively in bottles, Cigar City Brewing decided to use the can release of their Florida Man Double IPA to rethink the label design. The brief called for a departure from the previous mugshot label, instead envisioning Florida Man as the world's worst superhero. In order to build the new art direction, I looked to existing Florida iconography; as well as to Cigar City Brewing's Jai Alai, their signature beer. I decided to render the characters themselves in a style evocative of the work of Jack Kirby and Bruce Timm. I worked up three loose concepts for the character of Florida Man. One was a take on the classic Superman pose with a color scheme inspired by Florida's college sports teams. The next concept imagined alligators as Florida Man's nemesis and referenced the state's "gator-rasslin'" tradition. The last concept imagined the character as geriatric superhero, speeding to the rescue in a scooter—one of Florida's most common sights. The client chose a mixture of concepts 2 and 3, opting to depict the gator-rasslin' superhero inside a decorative badge. Based on the notes, I worked up a tighter sketch (right). Once approved, I used the thumbnail as reference to create a final pencil drawing. I then imported the drawing into Adobe Illustrator, where I created the final vector design. 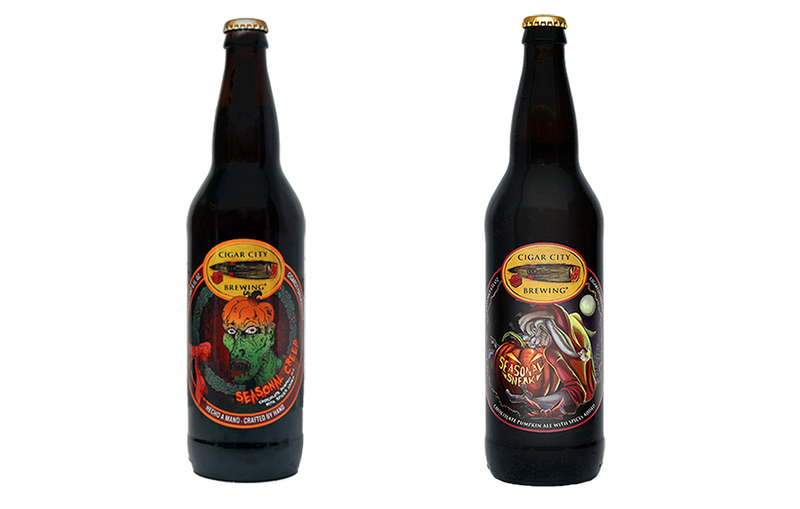 Seasonal Sneak is a seasonal Pumpkin Ale released by Cigar City Brewing. 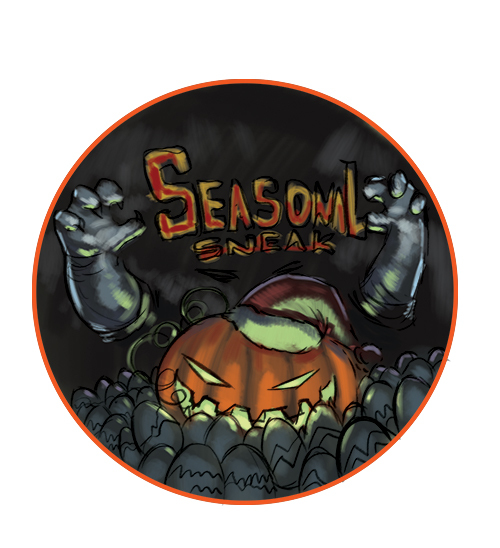 Usually released during the summer time, ahead of the multitude of pumpkin beers, the release is made to poke fun at the ever expanding holiday season and its accompanying anxiety. When Cigar City Brewing decided to rename their Seasonal Creep pumpkin ale, the opportunity arose to create a better visual representation of the concept. The brief called for a character to represent the beer, a "horribly disgusting hybrid monster composed of elements from every holiday". For the art direction, we settled on a hybrid of Chuck Jones and the R.L. Stine Goosebumps book covers. Based on the brief, I settled on a design with elements from different holidays. The character itself is an evil take on the Easter bunny, wearing Santa's outfit, stealing a Jack-O-Lantern. I created three versions of the concept. Once the client chose their preferred sketch, I painted the final illustration in Adobe Photoshop.